Did you know that 22% of employee turnover happens within the first 45 days1 of employment? Most companies still make the mistake of expecting employees to get “up to speed” within the first week or two, but the onboarding process needs to be much longer than that. It takes a long time to adjust to a new environment, learn the ins and outs, the different tools and processes, etc. It’s amazing how little time and energy is put into onboarding at most companies when you consider how much time and energy is put into recruiting. Think of the money and time spent creating job descriptions, promoting them, contacting hundreds of people on Linkedin, and doing multiple interviews. Onboarding is arguably the most important part of making sure an employee stays engaged. If you don’t take the appropriate steps to onboard a new employee, they’ll likely quit. Employee onboarding should be at least 90 days long. According to the book The First 90 Days, it takes about 90 days for an employee to start adding value to your team, meaning that those first 90 days are an investment to train the employee to get them up to speed. In this post, we’ll share some tips for better onboarding and look at some real-world examples from companies (including Officevibe). 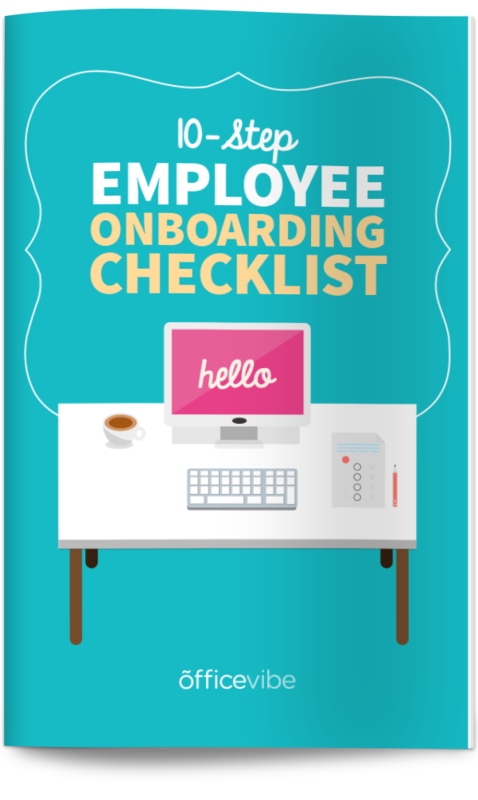 Make sure to check out our complete guide to learn everything you need to know about employee onboarding. Onboarding is much more than making sure the new hire has their equipment and space set up (although that’s part of it). If done right, the investment you make in the onboarding process can last for years into the future. Inspired by Simon Sinek’s famous TED talk about how leaders inspire action, you need to give new hires a crash-course on your business. You want them to understand the same things that you do without them ever having been there. You can start with things like your company history, your culture, values, target customers, etc. and then move into things like why certain decisions were made, why certain features or projects came before others, etc. A smart idea is to build a presentation in Powerpoint or Keynote that you can reuse every time someone new joins. A great idea is for you to set up a mentor or “buddy” that the new hire could turn to for any questions, no matter how silly. Asking questions can be tough for someone new, they might still be a little shy, but connecting them with someone who is dedicated to answering questions will be helpful for them. It also sends the right message to the new employee (that asking questions is good), making them more comfortable to ask questions to others as they get more comfortable. Mentoring sessions can have massive effects on the success of new hires. One study 2 found that mentoring connections that employees made in their onboarding process were related to their productivity and confidence levels five years later. The most important factor for whether an employee is engaged or not is their relationship with their direct manager. On day one, you should be working to establish a relationship with them that will make you guys closer and more connected. Use this time together to explain the agenda for their first week or two, and explain what role they play in ensuring the company’s success. Tell them how happy you are to have them on the team. The goal of your time together is to get them inspired and excited to start adding value. Joining a new team can be very intimidating, and many people (especially introverts) have a hard time reaching out and forming those connections. As a good leader, you can help create some of those connections by organizing activities for everyone to get to know each other. One study3 found that people who hadn’t established meaningful connections with coworkers were less likely to seek out information, which is critical to success for a new employees. With social media, you could even help current employees connect with new employees before they even start working there. There is an incredible article in MIT Sloan Management Review (seriously, a must-read) called “Reinventing Employee Onboarding” where they talk about how the traditional approach most companies take with onboarding is all wrong. They talk about how most onboarding processes indoctrinate new employees into the organizational culture, forcing the values onto them and not letting the new employees express themselves authentically. When an employee is authentic, they’ll have a higher self-esteem. People want others to see them as they see themselves. However, we have found that the traditional methods of onboarding have some serious weaknesses. They assume that organizational values are something to be taught to and adopted by newcomers. This creates a tension: When newcomers are “processed” to accept an organization’s identity, they are expected to downplay their own identities, at least while they are at work. But subordinating one’s identity and unique perspectives may not be optimal in the long run for either the organization or the individual employee because suppressing one’s identity is upsetting and psychologically depleting. You want to check in as much as you possibly can, even if you think you’ve done enough checking in, you likely haven’t. You want to be pretty aggressive at the beginning to make sure that new hires are comfortable and are integrating themselves okay. After the first week or two, you should still check in, but not as frequently. The key is that you want to be looking for ways to improve the onboarding process for the next person that joins the company. Here are a few examples from other companies that hopefully will help you improve your onboarding process. The Zappos Family New Hire Program is a four-week training program that everyone in the company, regardless of department or role, goes through. The program is split between technical training and culture immersion, with some team building activities thrown in. At the end of the four weeks, there is a small graduation ceremony for the class. Rover.com, a dog-boarding website (think AirBNB for dogs), has their software developers make live updates to their website on the first day of the job. This empowerment is amazing, and goes against most traditional onboarding processes. It helps employees feel like they truly have an impact at the company from day one. Booz Allen’s onboarding program is very well done. They get access to an onboarding portal before they even start, attend company-wide orientations on day one and two, and onboarding lasts the entire first year. New employees are also given access to a sponsor that checks in with them regularly, starting from the first week. At Officevibe, we’re still learning and perfecting our onboarding process. One of the beauties is that I’m fortunate enough to do an immense amount of research into what works and what doesn’t with all the writing I do. We also use Officevibe to collect feedback from our new hires about how their onboarding experience was, so that we can improve every time. How Do You Onboard Your Employees? Any tips or tricks you could share with us? Let us know in the comments!